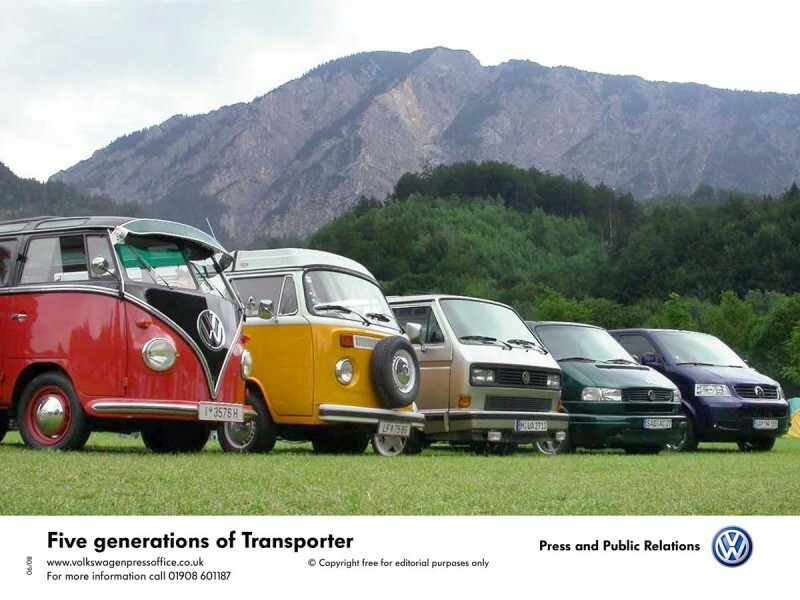 Volkswagen Campervans were invented shortly after WWII in a Germany. A Dutch importer to the factory noticed the motorized trolleys that were transporting parts within the factory, made from running gear and stripped down VW Beetles. Strange looking though they seemed, they were enough to inspire a beetle-based van design, with a bit of a box-on-wheels look to it. It took a year, but the new Volkswagen chief executive saw something in the new creation and soon launched the first Volkswagen Van at the 1949 Geneva Motor Show. Less than half a year later, an average of ten vehicles were produced every day. That basic box-like design stayed unchanged over the next four decades and more than five million buses. The vehicle filled a market gap for sturdy, simple and inexpensive transportation. 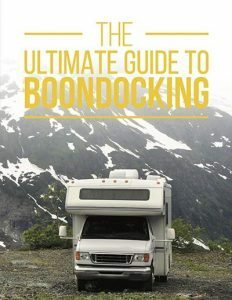 The design of the transporter, being so simple, was easily changed, and hundreds of combinations were made, including buses, pick-ups, ambulances, fire engines, delivery vans, pretty much any kind of mobile food vans, and last but not least, the camper. It appeared in all its glory only after 1970, after many modifications. The initial split-screen windshield was replaced by the ‘bay’ window version, a major rethink. Aside from the one piece windshield, a lot of inner mechanisms were changed — from the size of the engine to the design of the bumpers — and pretty much every mechanical part! 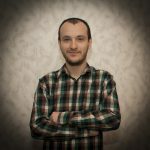 The new design was a roaring success, and the technology to go with it made it one of the most reliable vehicles on the market. That was the point when other firms, like Devon, Viking, and Westfalia took to working on the idea. The major changes from then on were sleeping, cooking and storage configurations. And so the reign of the campervan began. 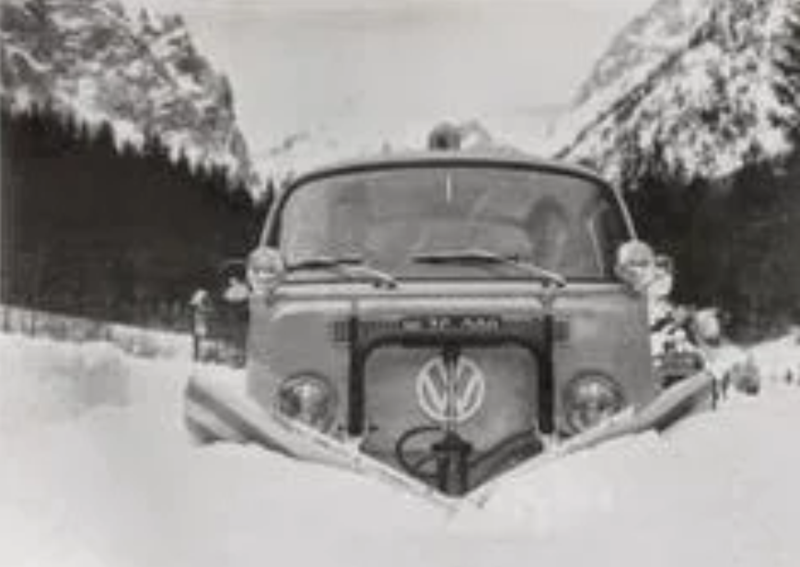 The point of the this history lesson was to show that the VW Campervans, innocent and fragile though they might seem against the fury of mother nature in the dead of winter, are a creation based mostly on evolution. 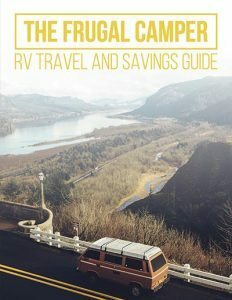 And when there’s a need to be fulfilled, the campervans jumps to fill it. 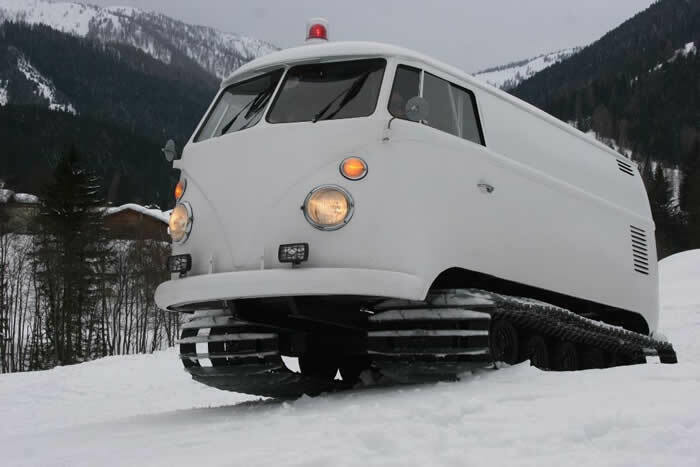 So in the spirit of the always evolving VW campervan, let’s take a look at how it performs in the snow. 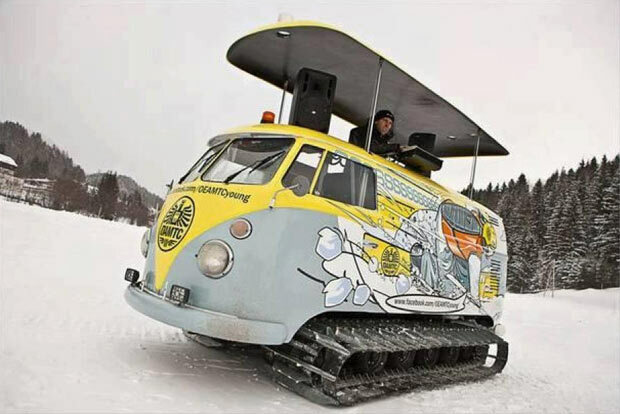 For yet another skill to be mastered by this prodigy VW campervan, a makeshift snow plough is attached to the campervan… and it actually fits! Well, the Campervans is doing okay in the snow, apparently, but for yourself you should make sure to bring plenty of additional heating if you want to go camping in freezing temperatures. Did anybody say snow was too big of a challenge? Apparently the snow is not too big of a challenge for this beautiful emergency Split Window Bus fitted with snow tracks. With the pure white paint it sure does look like the bus has adapted perfectly to its new habitat. If you don’t believe a Type 2 can make a mountain trip in the snow, this picture is sure to prove you wrong. Looking good! 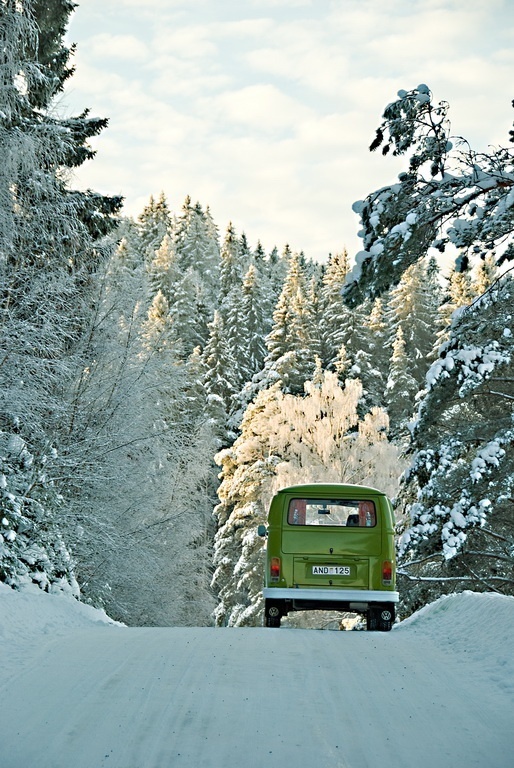 As you can see, the VW Campervan can adapt to all climates and situations. 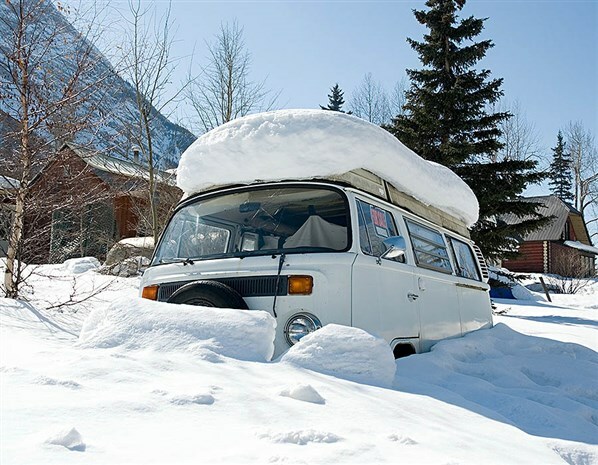 Do you have any stories of your own about VWs in the snow. Share them in the comments below.